Scolds Bridle are Sue Bousfield and Liz Moore. Sue plays English concertina and Liz guitar and bouzouki. 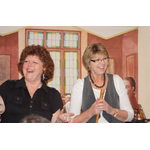 Expect great harmony singing from this well respected duo whose songs range from the poignant to the hilarious. They have appeared in many productions based on the Fylde area and had a number of songs written especially for them.